Symphysis Pubis Dysfunction happens when the ligaments that keep your pubic bone and pelvis stable become overstretched and no longer stabilize your pelvis. Essentially, a structure that is designed to move very little begins to move a lot, and it can be very painful and difficult to move with ease. SPD is a condition that sometimes arises during pregnancy, though it can also first occur during labor and birth or in the postpartum period. Pelvic girdle pain in general is quite common during pregnancy—between 48% and 71% of women report feeling significant pelvic discomfort. About 30% of women report that the area of the pubic symphysis is painful. 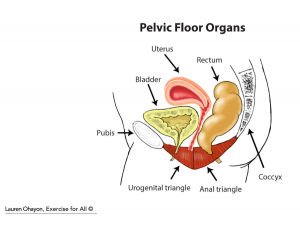 While SPD does involve the pelvis and the integrity of the pelvic floor muscles, a general pelvic floor dysfunction treatment like kegels is often not the answer to symphysis pubis dysfunction. The factors that predispose people to SPD are quite varied; however, the medical literature on symphysis pubis pain seems to agree that the hormone relaxin is not entirely to blame. Factors as different as hypermobility, bearing twins or other multiples, and a history of back pain can play a role in pubic symphysis pain during pregnancy. SPD usually resolves for most pregnant people after delivery, with most returning to normal function by 6-12 months postpartum. Rarely, some people find that SPD becomes a longer-term problem. Most people are able to have a vaginal birth even with pubic symphysis dysfunction—finding pain-free ranges of hip movement prior to labor can be helpful if such a delivery is in your birth plan. Standing with more weight on one leg (with hip hiked up) to hold groceries, kids, etc. Once you’ve checked in with your care provider, you can take some simple steps to manage SPD pain. Your goal when moving to relieve pain due to pubic symphysis dysfunction is to create more stability in the pelvis. Sleep with a pillow between the legs. Sit on the sitting bones rather than the tailbone. Lie on your side rather than your back to sleep—take some of the load off of your pelvis. Keep your knees together when doing things that aggravate SPD—for example, getting in and out of the car, swivel your legs to one side and then stand up. Build up strong hips and glutes. The video below has my favorite go-to SPD exercises. Some people find a support belt to be a helpful tool while building up stability in the pelvis. With mindful movement and a more stable pelvis, SPD can be much less painful. Become stronger, more supple, more balanced, and more able.